Of all the major currencies, the biggest mover today was AUD/NZD. After consolidating for the past 2 weeks, the currency pair surged 1.3%. This was the strongest one-day rally since October and has many traders are wondering whether we are finally seeing a bottom in the pair. Yet what we find interesting about the move is that it is not supported by fundamentals. China reported weaker manufacturing activity in January, which is bearish for Australia while house prices in Australia declined. In contrast, the Reserve Bank of New Zealand’s comments on Wednesday led many economists to believe that the central bank is gearing up for a rate hike in March, which should be positive for the currency. 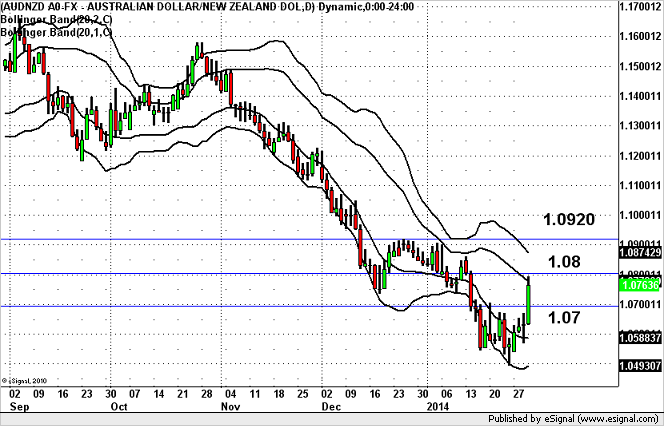 Therefore from a fundamental perspective, AUD/NZD should be trading lower and not higher. However we have to respect the price action. A massive short squeeze lifted AUD while investors are selling NZD despite the prospect of a rate hike. Therefore we would only look to sell AUD/NZD if it drops below 1.06. Technically, today’s rally in AUD/NZD has taken the currency pair to the first standard deviation Bollinger Band, a potential level of resistance. If AUD/NZD breaks above this point, the next resistance will be at 1.0920. On the downside, there is some support at 1.07 but the more significant support is at the 8 year low near 1.05.